BWMP electronic room NO. plate can display some information about the room state, including ‘No disturb’, 'Please clean up', ‘Please wait’, ‘Room number’, ‘Rented or not’( showed by the doorbell backlight), and it also has a touch doorbell button. We can not only provide you with different types of the room plate, such as four-in-one, five-in-one, six-in-one, can also design or print the logo according to your request. 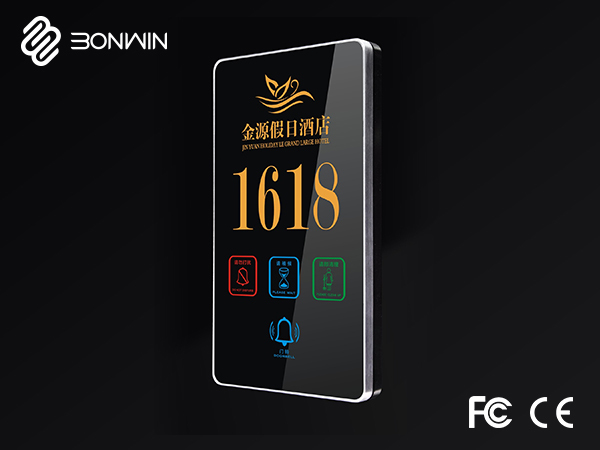 The display signal is synchronized with the request panel of the room service and management software. Designing LED backlight touch-key achieves switch control. With the normal pattern, the room plate is clear and easily understood, and the light can be directed so guests could control it under any lights. The design of EEPROM can always save parameters. In the case of power-off, EEPROM can still save the hotel parameters. Bonwin electronic room NO. plate can be well connected with the hotel control system. It is not only suitable for triggered DC or AC doorbell, but also for edge-triggered music doorbell. The door has a distinctive sounding part, which is transparent, comfortable and pleasant. According to the hotel's requirement, you can select wired smart room number plate system or wireless doorbell system, and you can also install the touch control panel of 'Please wait' or others in the room. 1. In normal conditions, pressing the button of touch doorbell and then the bell rings, guests will know that there are someone at the door. 2. When guests press 'No disturb' switch, the backlight of 'No disturb' on the touch screen will be lit, then outdoor screen will display 'Please do not bother'. Now, the touch panel and the doorbell don't work. 3. When guests press the button of 'Please clean up', the backlight of "Please clear up" on touch screen will be lit, the outdoor screen will display 'the room need to be cleaned up'. When guests take the door card and then leave the room, the outdoor screen will "Please clean up" be still lit, so room attendants can clearly konw the request of clean-up. 4. When guests are inconvenient to meet the visitors, they can press the 'Please wait' switch or 'Please wait' button, the backlight of 'Please wait' on touch screen will flash, it suggests that visitors need to wait a moment. Now,the doorbell doesn't work, , the electronic door number plate will return to a dark backlight after 2 minutes.